The set has Two Offset bushings to correct pulling to one side and or crossmember misalignment or to correct caster angle. You will need to determine which way the correction will need to go prior and during installation which may require additional alignment time. a shop press is strongly suggested for ease of install. Its pretty much manditory don't try to do this without one. 3" thinwall aluminum tubing can be uses as a press collar. 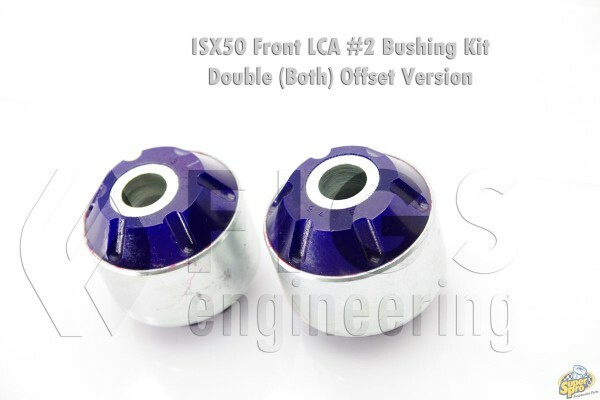 The bushing sits at the back of the front LCA which is held on by two bolts into the chassis and one bolt through that is an extension of the arm. You will need to remove both undercovers and the side bracket bolt that is attached to the #2 bushing bracket. Remove the rear nut that holds the bracket to the LCA. Remove rear bushing bracket, this may require deflection of the front arm bushing. If too difficult you will need to remove the entire arm, sway bar and shock absorber. Contact FIGS is this is the case. With a shop press, remove the old bushing. Press the new bushing into the aluminum retaining bracket. Keep in mind that you will press in to correct the alignment condition and offset the rear mount. Use this to adjust the caster angle when out of spec. This may require iteration since the bearing presses in. Its best to spot check the alignmet while determining the location of the offset. For uniform caster angle you will need to look at the alignment sheet. mount goes out to increase and inward to decrease. Reinstall rear nut to hold bushing in place but not to final torque.